Conservation experts are encouraging dog walkers to keep their pets close to heel for the next few months to protect rare ground nesting of birds on the East Devon Pebblebed Heaths. The heaths near Exeter are one of a handful of locations in Britain where the Dartford Warbler can be found and, after a harsh winter, they need the best possible chance of breeding successfully this summer to rebuild their population. They are joined by Nightjars, another ground nesting species, which spend their winters in Africa and return to the East Devon Pebblebed Heath to breed. Kim Strawbridge, Site Manager of the East Devon Pebblebed Heaths, said: “The Dartford Warblers and Nightjars are both species of conservation concern and it’s vital that we respect their space and allow them to breed. Many of the bird species, including the Dartford Warblers nest on or near the ground, not in trees, so are particularly sensitive to disturbance. Severe disturbance can lead to the adults abandoning the nest leaving behind the eggs or chicks, opening them up to a greater risk of being found by predators”. Dartford Warblers are still regarded as Amber List species and can often be seen in lowland heathland with gorse and heather, Toby Taylor from the RSPB commented: “These ground nesting birds are a nationally rare species with just 3,400 pairs in the UK. It is imperative that we try and help give these iconic heathland birds the best possible chance to breed this summer at Pebblebed Heaths”. During the summer months, dog walkers are being urged to keep to the paths with their dogs on leads if necessary, to make a significant positive impact on the birds’ wellbeing and productivity. Kim added; “We want people to enjoy their visit, rather than worry where or what their dog is up to. So if you’re not confident that your dog will stay on the path close to you, and come back when called, then you should use a lead”. The Pebblebed Heaths Conservation Trust is working with Devon Loves Dogs, a free membership scheme for dog owners and walkers. They are running a programme of free monthly dog friendly guided ‘waggy walks’ so that people can learn more about the thriving heaths and how they are looked after. The next walk takes place on Thursday 5 July 2018, starting at Uphams Car Park, Woodbury Common, at 10am. 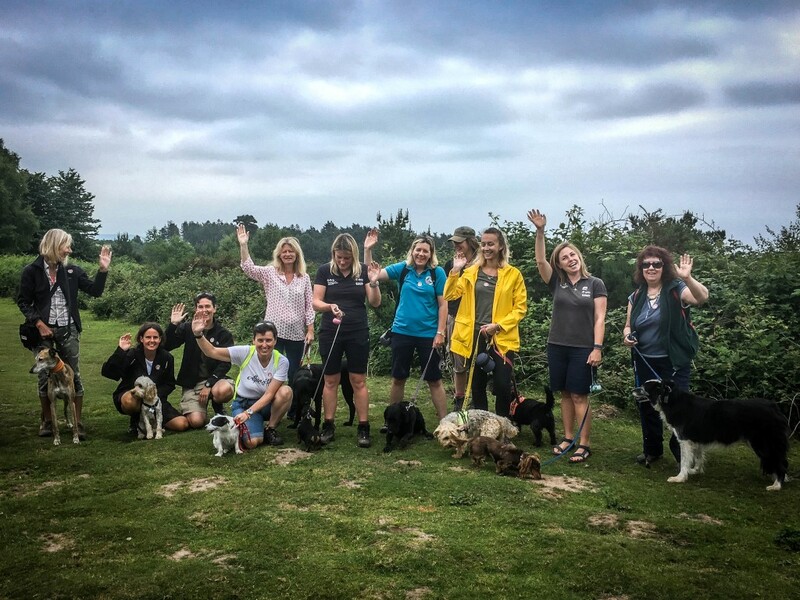 Julie Owen, Project Co-ordinator at Devon Loves Dogs, commented: “The monthly ‘waggy walks’ have been so popular with keen dog walkers and it has been fantastic to have this opportunity to tell people why these heaths are so special for our local wildlife. These small changes of keeping dogs on the path and picking up after them will have a huge beneficial impact to protecting nesting birds on the Pebblebed Heaths”. Earlier this year, the Pebblebed Heaths Conservation Trust, the RSPB, Devon Wildlife Trust, and the South East Devon Habitat Regulations Partnership combined forces to launch the Pebblebed Dog Code, which highlights simple ways that dog walkers can enjoy the spectacular heaths in a way that respects the local wildlife, land owners and other visitors. Kim Strawbridge said; “The Pebblebed Dog Code has been well received by visitors and we hope that it makes it easy for people to understand their responsibilities while they visit the heaths with a dog. It has been lovely to meet people and their dogs on our monthly ‘Waggy Walks’ so that we can show them why the heaths are so special. “We have a brilliant network of paths across the heaths and so it makes keeping to the trails a very simple, but hugely beneficial way to protect wildlife during this important time”. For more information on the Pebblebed Heaths, please visit www.pebblebedheaths.org.uk and to join Devon Loves Dogs, visit www.devonlovesdogs.co.uk.